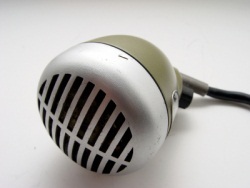 The microphones we are talking about in this series of articles are referred to as either “high impedance” or “low impedance.” In general, a vintage bullet mic is a high impedance device and a modern vocal mic is a low impedance one. This is not always the case, however. We can use an impedance matching transformer: a simple device that can “match” (or adjust) a low impedance mic to a high impedance load, or vice versa. Low impedance systems were developed after high impedance ones, and were designed to enable much longer cable runs and better reject noise (like hum) that is picked up by the cable. There’s no difference between low impedance and high impedance microphones if you are looking to improve your tone and get better resistance to feedback. Merely switching from one kind of microphone to the other will not guarantee improvement. Low impedance systems are almost always wired with XLR jacks and plugs. This is a worldwide industry standard. Many different kinds of connectors are used for high impedance devices, including XLR. However when XLR is used, the cable-to-pin wiring is not the same as it is for low impedance XLR. Mixing low- and high-impedance cables and mics just because you can connect them together with XLR can lead to poor performance. When you see a 1/4″ jack or plug (like guitar players use) it’s a safe bet that you’re looking at a high impedance device. The same is true for the “screw-on” connector that was made by Switchcraft and Amphenol, which was found on many vintage mics and is still produced today. There’s nothing wrong with connecting a high impedance mic with an XLR connector to a high impedance load (like an amp) with a cable that has XLR at one end and a 1/4″ connector at the other. There is something wrong, however, with using that same cable to connect a low impedance mic to the amp – because there is an impedance mismatch. In this case a proper low impedance (XLR to XLR) cable should be used, together with an impedance matching transformer. Technical note: By definition, impedance is “a measure of the opposition to the flow of alternating current through a circuit” , that current being the signal from your mic, which in loose terms is an electrical picture of the sound going into it. POWER in electrical terms is the rate at which electrical energy is fed into or taken from a device or system. You can have the same amount of power with low voltage and high current, or high voltage and low current. 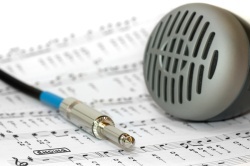 Low impedance mics have a signal with more volts and less current; high impedance mics are the reverse. Now we’re all matched up and our power transfer is optimal… SKREEEK, SKRONNK! Uh oh, feedback. If you’re a harp player with a microphone, chances are you’ve heard that awful sound. Next time around, we’ll tell you why it happens and how to manage it. Trying to do some research on a mic I acquire but I do not know anything about this subject. What I have is a Calrad Dynamic microphone DM-9 on a short stand. Can anyone tell me about it?? i,ve got a green bullet microphone,what will i need to set it up with a powerful valve amp,to get that chicago blues sound,like a 59 bassman to match a band. champion mr eubanks. male pins but the amp is 1/4″ jack fitting can I get a transformer that will take the mic. different plugs and will they play thru and give me the signal boost that the amp demands? Very informative – thanks! I do have one question – I have a CR element in a JC30 shell and I’ve just aquired a MC-151 crystal element, again in a JT30 shell. Through the same amps (a Silvertone 1482 and a 1484) The CR mic sounds great but the 151 is lacking bite and volume. I’m assuming this is because of the different impedances. Both mics have the jack socket adapters and ideally I want to be able to swap mics by just uplugging one and plugging in the other, so tinkering with the amp isn’t going to help. Is there anything I can do with the crystal mic, within the mic, to match the impedance? Thanks! 🙂 Mark. Hi again Mark, here’s some feedback from Johnny Ace..
And also some input from Greg Heumann at Blowsmeaway..